If you saw Ben Crenshaw sink that final 3-foot putt in the 1995 Masters, then you've seen an iconic Wilson 88 Series putter in action. Based on some of the most classic putter designs in golf, the current 88 Series consists of five models. The 8882 model is a simple flanged blade design -- but sometimes simple is best. Of course, the current offerings from Wilson Golf employ modern technology in their creation, including Wilson's Visual Alignment Technology, or VDP as it is known, that uses multi-surface markings to help the golfer better line up their putts. The faces are dual-milled -- one pass to created a truly flat face and a second imparts arched grooves designed to have slight "spin correction" on off-center hits. 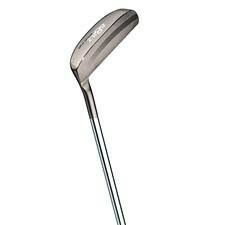 The heads are milled from soft stainless steel for improved feel. Available in Right hand only these days, they are fitted with a steel shaft and soft polymer grip from Golf Pride. Perhaps because Ben used one, or maybe due to Phil who did also, I've always like the look and feel of this putter style. With putter options today that look more like boat anchors or back-scratchers, the simplicity and straightforward utility of this model hearkens back to an earlier time in golf. It's hard to argue that the advancements in putters have not helped many a golfer better get the ball in the hole, but a good putter is the one that feels comfortable in your hands, and the Wilson 8802 (nearly identical to the 8882) has always been that for me. While this putter might provide great feedback and a satisfying feel at impact, it does suffer on off-center hits. The heel-shafted and toe-weighted design create an open-to-closed putting stroke. Again, that method works for many golfers. But if your putting style is more straight back-straight through, you'll fight (and probably curse) this putter from day one. At the end of the day, whether you're 63 or 23, the Wilson 8882 putter, or for that matter any of the 88 Series, has a certain appeal that cuts across all generations of golfers. Please note that Ben did not use an 8802 putter for his 95 Masters win. It was a Cleveland model he designed along with Rodger Cleveland. He won the 84 Masters with the 8802.